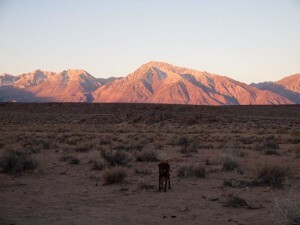 We’ve been in Bishop for over a week now and have settled nicely into a sandy plot of BLM land only a few miles north-east of town. 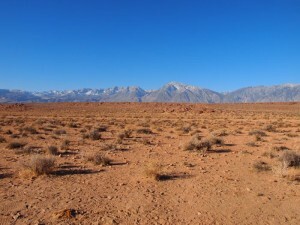 It may look wide open and desolate out here, but for some reason it doesn’t feel that way. I suppose it could be the two HUGE mountain ranges on either side of us. Behind us are the White Mountains. They face west and turn a gorgeous shade of red in the evening. 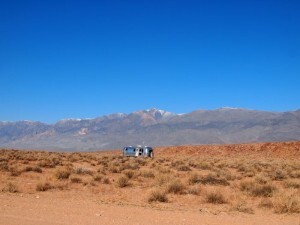 And in front of us are the Sierra Nevada Mountains. They face east and turn an equally gorgeous shade of red in the early morning. 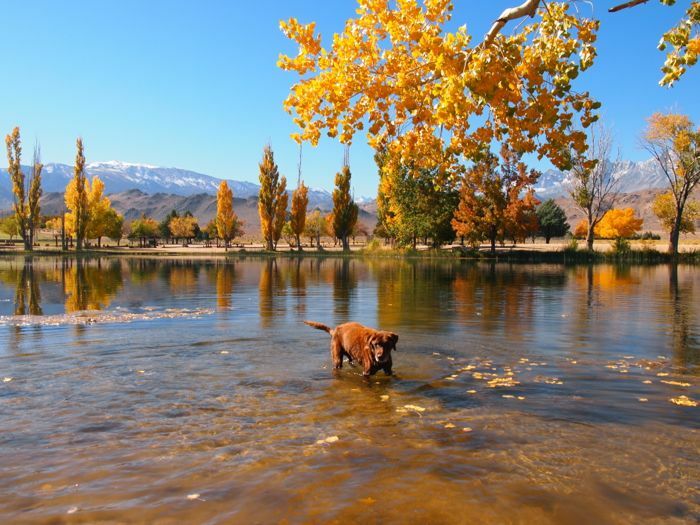 Even though there is not a single tree in sight out here, you don’t have travel far to find autumn’s splendor. Last weekend we went in search of a different kind of tree. 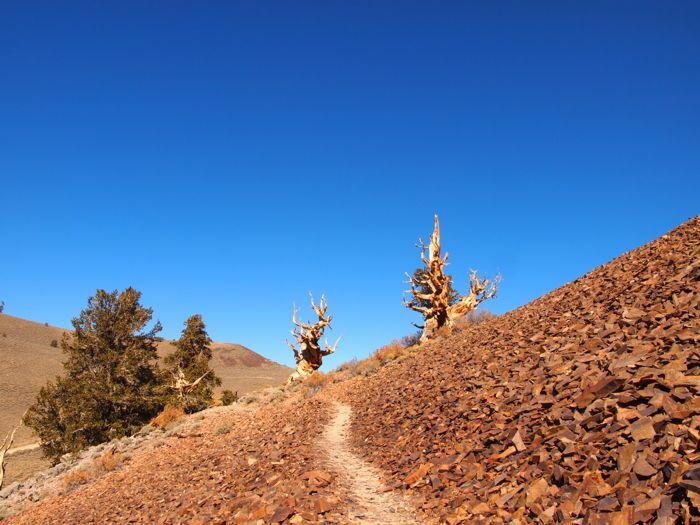 An hour from Bishop high up in the White Mountains lies the Ancient Bristlecone Pine Forest. 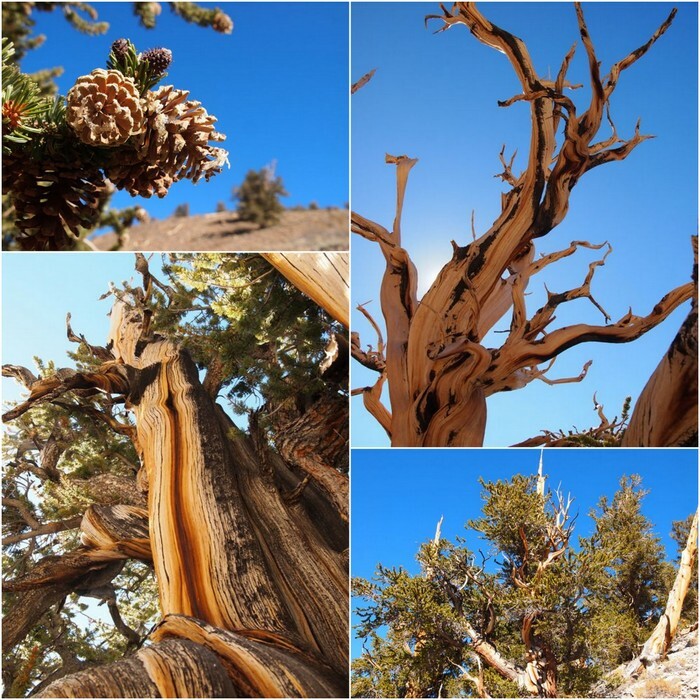 The trees in this forest are some of the oldest living specimans on earth. 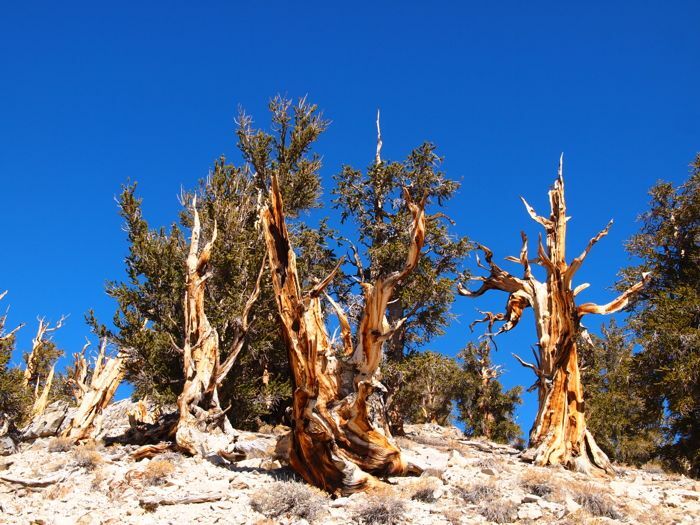 While Bristlecone Pines can be found growing around the high mountain regions of California and Nevada, the oldest live here in eastern California. 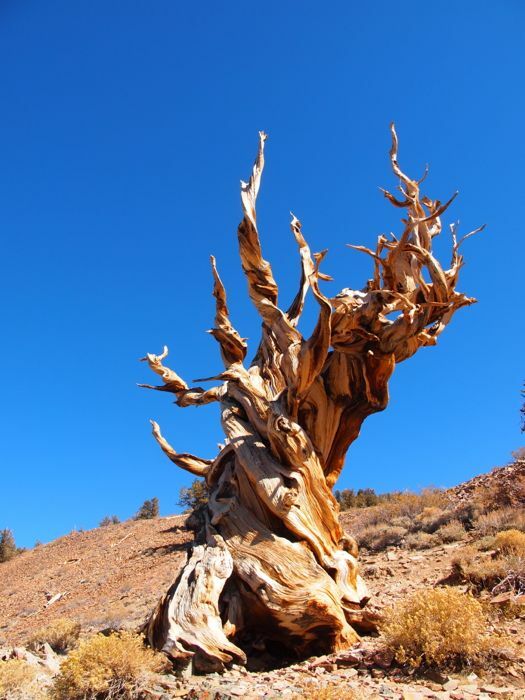 The very oldest tree in this ancient grove is nearly 5,000 years old! During our visit we stopped at the Schulman Grove and after touring the very nice visitor center, took a short hike on one of the nature trails. 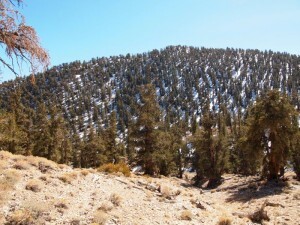 The ranger told us that the trees on one section of the trail were around 4,000 years old. Many of them looked half dead, with lots of bare branches and bark-less trunks, but those same trees also had new shoots of growth and lots of pinecones hanging from their branches. These guys are survivors. 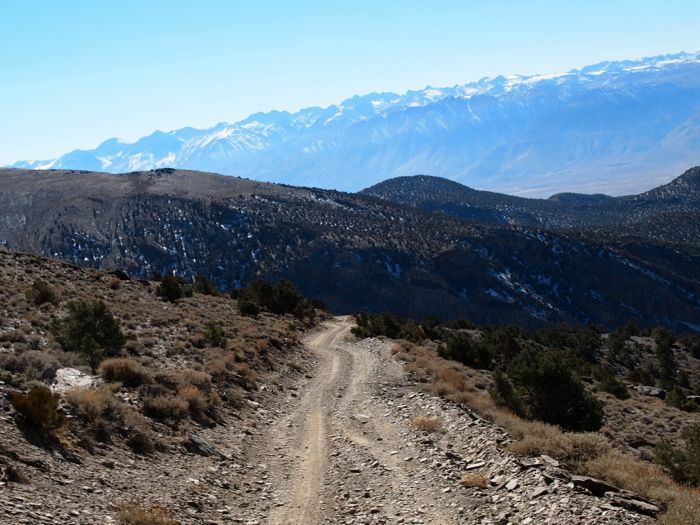 On the way home we decided to forego the main road and instead took the back route back to Bishop. 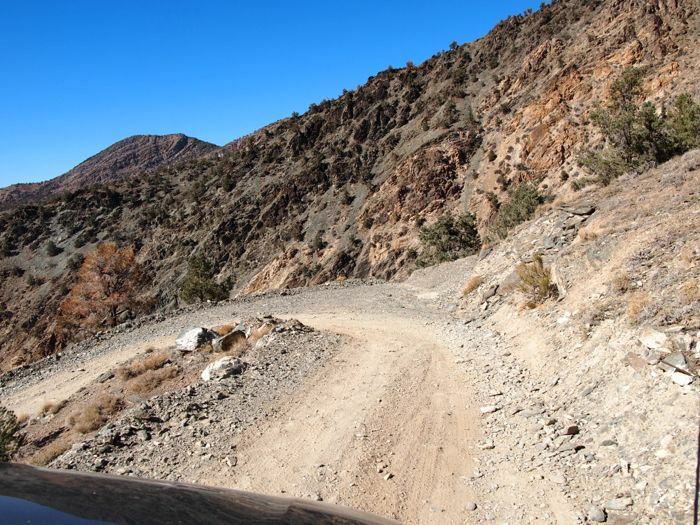 The road down through Silver Canyon is 12 miles of steep, skinny, sharp switchbacks recommeneded only for vehicles with 4WD. 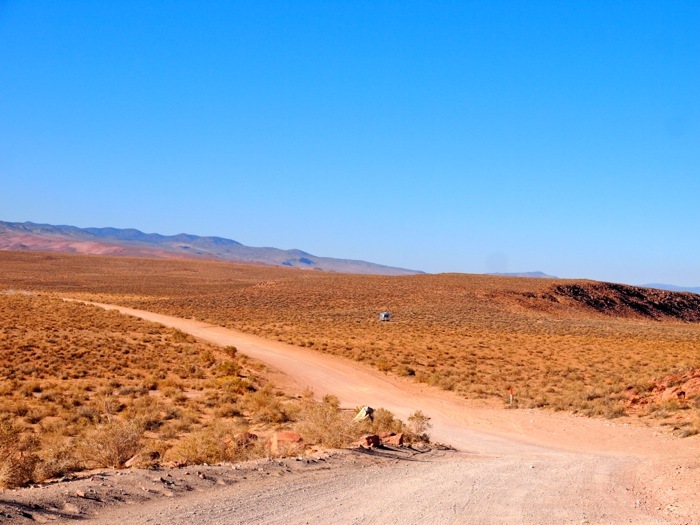 I couldn’t quite capture the true nature of the road as we slowly made out way down, but it was another great example of the many awesome 4WD roads that we have discovered out here in the west. 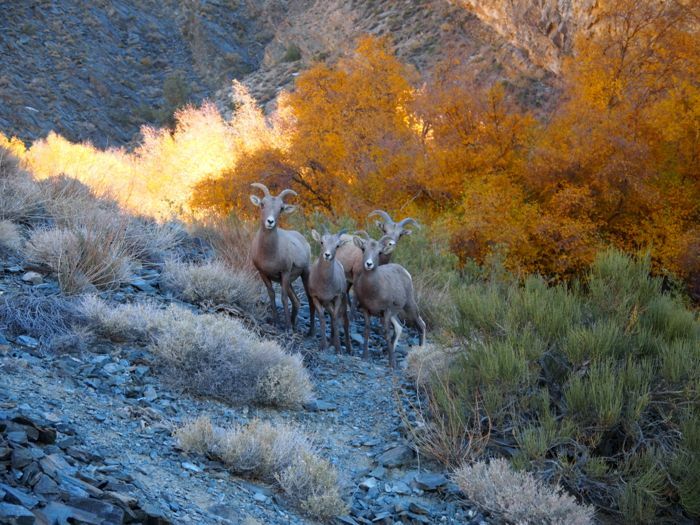 When we asked the ranger at the Bristlecone forest about Silver Canyon he excitedly told us that the last 7 out of 8 times he drove the road he saw Big Horn sheep. Sure enough, as we reached the bottom of the switchbacks there on the side of the road was a group of sheep. They froze in place and gave us a few minutes to take some photos before going back to eating grass. Later we learned that these are all female Bighorns. A pretty good looking bunch I would say. 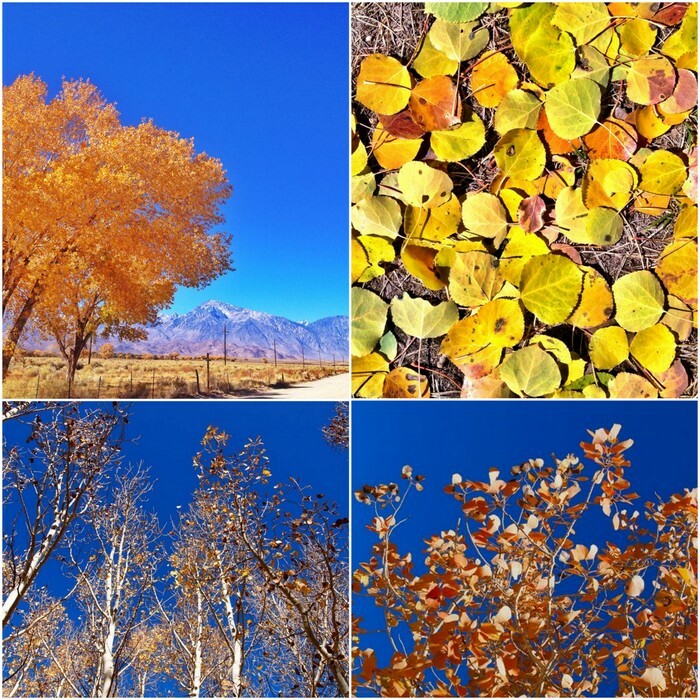 While we’re not out looking at trees, we have also fit in some time to check out the small, yet surprisingly bustling, town of Bishop. 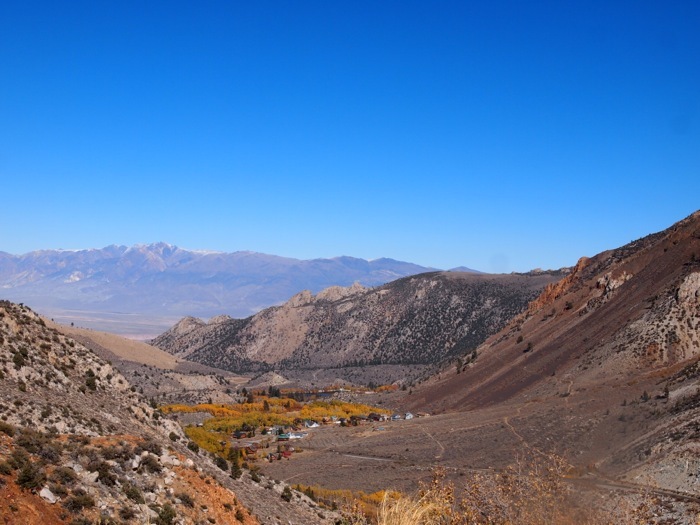 In addition to being a pretty busy thoroughfare for those traveling up or down Hwy 395, Bishop is also known as somewhat of a climbing mecca. All these visitors means that Bishop has no shortage of excellent eateries, coffee shops, sporting goods stores and galleries. Prior to our arrival we received numerous recommendations for places to visit while in town- most of those involving food. 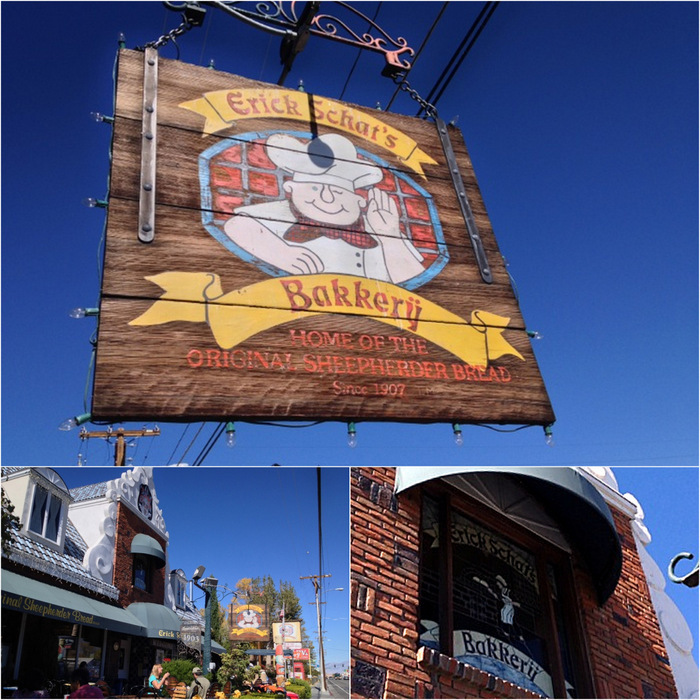 Not ones to pass up good food recommendations, we wasted no time checking out a few of them. Our very first night in town we visited the most excellent Mexican restaurant. It was a tiny, colorful, family run operation with the most flavorful food. We even discovered a new-to-us dish called Chili Rellano, which is basically a poblano pepper stuffed with cheese, battered in egg, then fried and smothered in a spicy sauce. Yum. Sorry no pictures because it was so good we didn’t even take a single photo. Next up was the famed Schat’s Bakery. Everyone, and I mean everyone, said this was a must visit while in Bishop. I am not sure that we got the full Schat’s experience since we resisted all the yummy pastries, cookies and, even the famous chili cheese bread. But our sandwiches as well as the loaf of 12 grain bread that we took home were delicious. 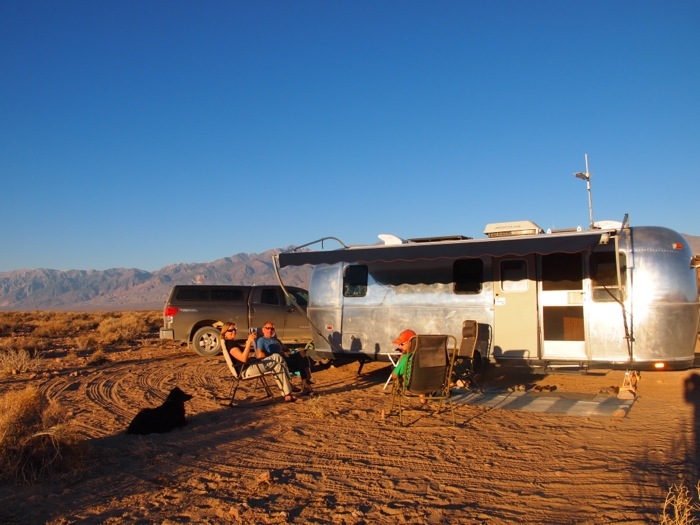 Finally, we had a night out with our RV pals Nina & Paul who are camped less than a mile down the road in another awesome boondocking spot. 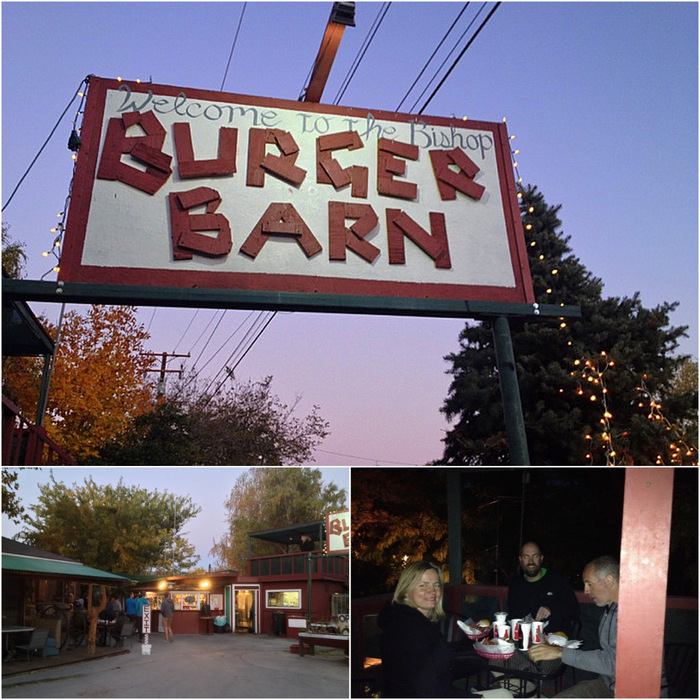 Last Saturday we got together for my birthday and after an outside happy hour went to check out the famous Bishop Burger Barn. This is another small operation with an eco-friendly slant that serves homemade, local food. We all indulged in some super tasty burgers, fries and milkshakes. Everything was amazing, and I won’t even hesitate to say that the sweet potato fries were the best I have ever eaten. 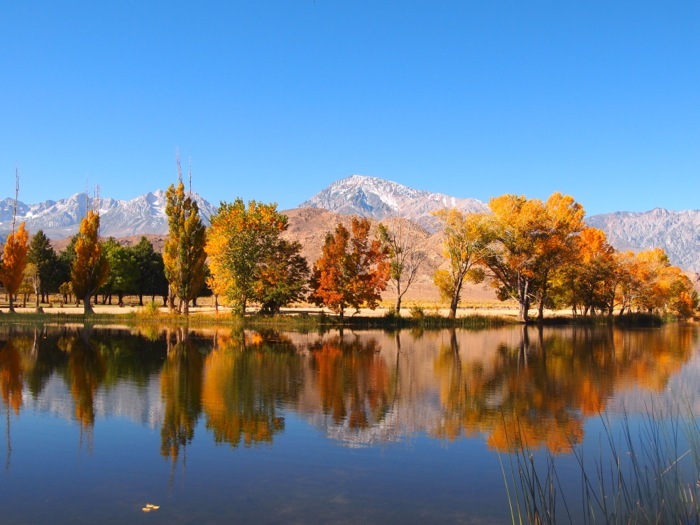 There’s still more to see and do here in Bishop so we’re spending another week here before we continue our slow journey south. Stay tuned for more to come about this fabulous area. 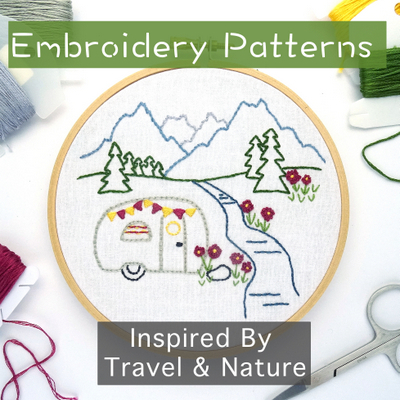 I love your blog posts. Great coverage as always. Do you not love Bishop? We were there in April/May this year and thoroughly enjoyed everything. 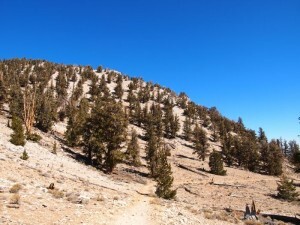 Unfortunately we did not get to the Bristle Cone Pines, but they’re on our list of things to do. 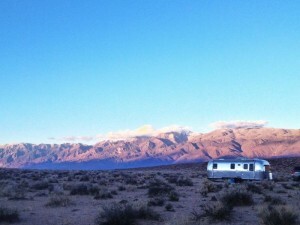 I think Owens Valley is one of the best places on earth. Thank you for the beautiful pictures. Yes! We love it here. Planning to leave at the end of the week, and we will be sad to leave. This is definitely a place I could return to again and again. 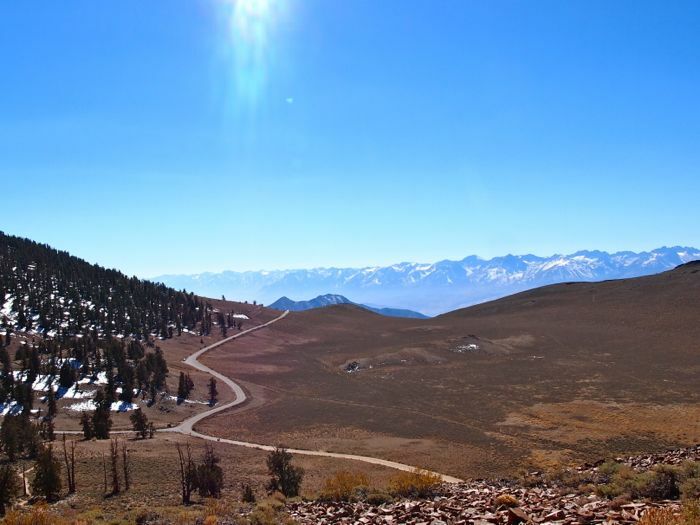 The Bristlecone Forest was pretty awesome but I bet it was still pretty snow in April/May. From what I gather the road through the forest is only open for a few months of the year. 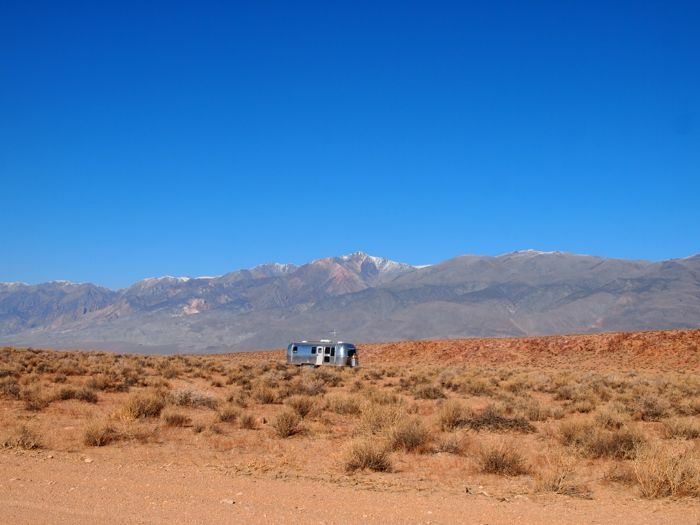 Now full time RV’ers, we plan to boondock in the tablelands tomorrow. Perhaps we will see you out there. We’ll be here until Sunday so you might just see us. Feel free to stop by and say hi!